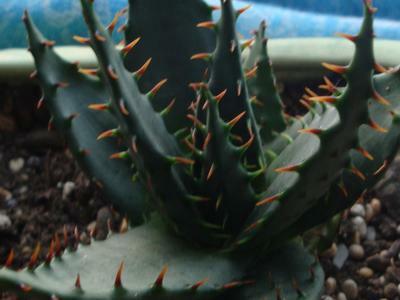 Hi Aga, this is a type of Aloe, which have those distinctive 'thorns' on the edges of the leaves, in a regular pattern. There are many many kinds, so it's difficult to say which one this is, but I'm leaning towards Aloe affinis or something similar. You can see more here: Aloe succulent plants and Aloe plants. I recommend using fluorescent tubes for most plants - keep in mind that they have to be really close to the plants to have an effect - like only a few inches. This will be fine for even your variegated plants, which prefer dappled shade if grown outside in their native habitat, rather than in full bright sun like their non-variegated kin. You can see more about grow lights here. Hope that helps with your propagation adventure!